Or view larger version. Warriors' Nate Thurmond with Franklin Mieuli and Oakland City Councilman Frank Ogawa. January 27, 1972. Prentice Brooks, photographer. Gelatin silver print. Collection of Oakland Museum of California. The Oakland Tribune Collection. Gift of ANG Newspapers. 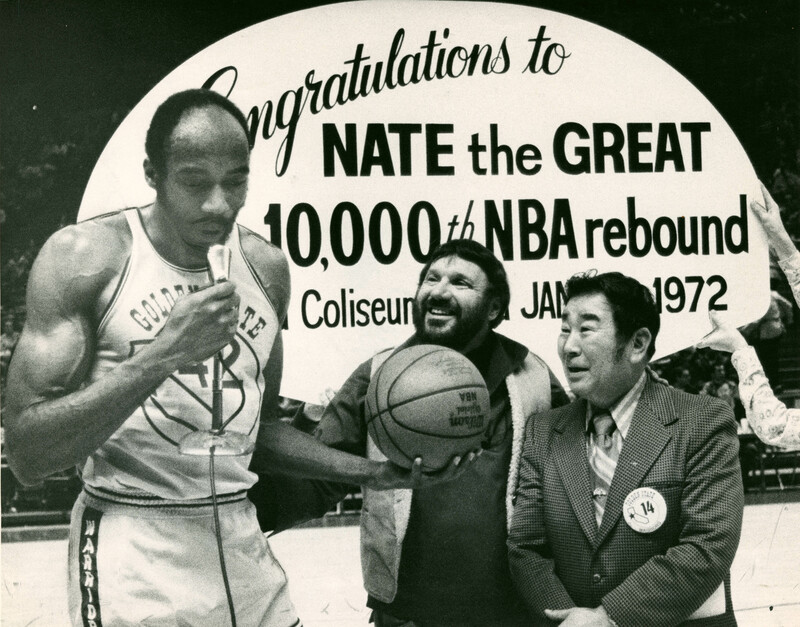 Golden State Warriors center Nate Thurmond receives the ball he grabbed for his 10,000th NBA rebound from team owner Franklin Mieuli, center, as Oakland City Councilman Frank Ogawa looks on. Thurmond reached the milestone on Jan. 27, 1972. Thurmond played for the Warriors for 11 seasons and was one of the team's most popular performers during the 1960s and 1970s. He went on to play for the Chicago Bulls and Cleveland Cavaliers and would capture 14,464 rebounds in a 14-year career. He would play in seven NBA All-Star games and would average 15.0 points and 15.0 rebounds for his career. Thurmond was elected to the Hall of Fame in 1985. While the NBA had been segregated until 1950 -- when Earl Lloyd of the Washington Capitols broke the color line -- by the time Thurmond's career started, African American players comprised a majority of the league's athletes.